I don’t know where March went, but obviously I’m a little behind on my blogs. So here are a few things I’m loving right now- let’s make this the March/April version! It’s short & sweet and will help you reduce your plastic use, and create less trash. I absolutely hate all the plastic packaging on products, but at times It’s really unavoidable. And super markets do us no favors providing plastic bags in the produce aisle. Here’s a quick solution to all those bags- BRING YOUR OWN!! These great reusable mesh bags come in various sizes. They even have the tare weight on the tags, in case you’re really cheap and don’t want to be overcharged by a penny or two. Plastic sandwich bags were the hardest thing for me to give up- mostly because if silly TSA rules. I’ve found a few alternate options now, including these silicone bags. Please don’t lecture me on silicone. These work, they don’t spill, and they aren’t being thrown out on a weekly basis because they tore. I use these reusable storage bags at home. I put leftovers in them, cut veggies, and even store soups and stews. The top closes easily like a zipper, and because they’re airtight, they won’t leak. They’re freezer safe, and easy to clean- I even put mine in the dishwasher! I love my glass storage containers. THey’re easy to use, microwave, freeze, and clean. I started with the basic meal prep sizes, and recently bought this set to replace a bunch of old plastic containers. There’s a size for just about everything, and I’ll likely buy more of these down the road. As I mentioned above, I started my glass container collection with these. 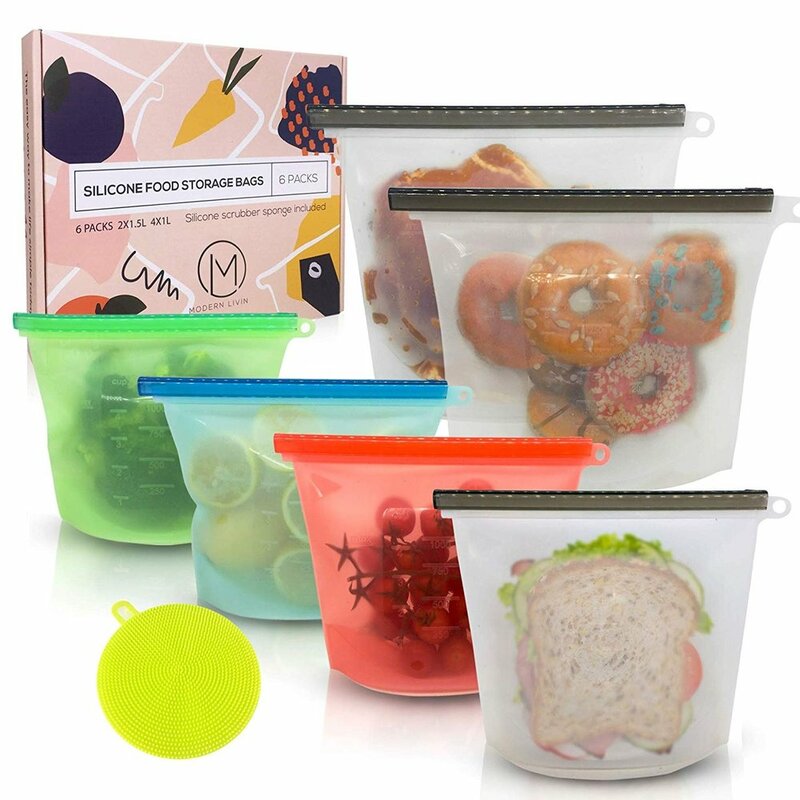 THey’re perfect for packing lunch, and easily fit in my portable cooler. There are two different containers in this set, one of which has a divider in the middle for smaller portions or those of you who have a fear of food touching. Again, they can freeze, reheat, and go in the dishwasher! I hope you check out the items here you’re not already using. Do you have any favorite reusable items you’d add to the list? ?